is really impressive to serve. Another plus, you can make this recipe ahead of time,which is great during the busy holidays. Decorate the top of the torte with cherry tomato halves, fresh basil leaves and sprigs of fresh rosemary. Torta [TOHR-tuh] Is Italian for “tart,” “pie” or “cake.” and/or Spanish for “cake,” “loaf” or “sandwich.” Torte [TOHRT] is a rich cake, often made with little or no flour but instead with ground nuts or breadcrumbs, eggs, sugar and flavorings. Tortes are often multilayered and filled with buttercream, jams etc. This recipe is combination of both. 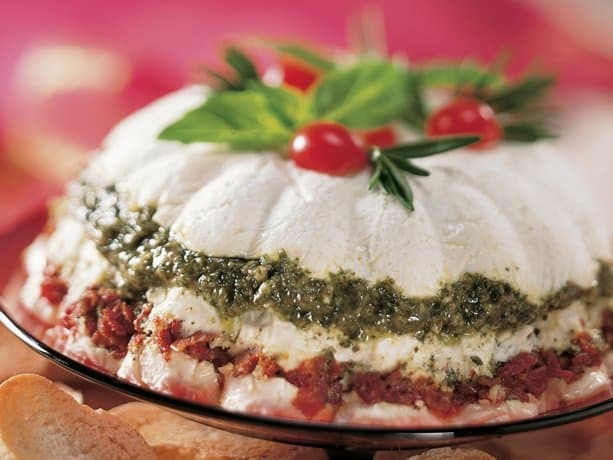 Multi-layers of cream cheese, pesto and sun-dried tomatoes. Pesto and Sun-dried Tomato Torte is delicious served with multi-grain crackers, tortilla chips or frito scoops. My favorite way to serve this layer dip is with lightly oiled, toasted baguette slices. Simply slice baguette into 1-inch slices, lightly brush oil on one side of slices, place non-oiled side down on baking sheet lined with parchment paper. Place baking sheet under broiler until slices are lightly toasted. Pesto and sun-dried tomato torte is a delicious layered dip that is served with crackers, tortilla chips or fritos scoops. In large bowl, place cream cheese, Parmesan cheese and garlic, beat well. Divide into thirds (1 cup each) Line 5-cup mold or 8 x 4 loaf pan with plastic wrap. Spoon 1/3 of the cheese mixture in bottom of mold, smooth top with spatula, spoon pesto evenly over cheese layer, spoon 1/3 of the cheese mixture over pesto layer, smooth top with spatula, spoon sun-dried tomatoes evenly over second cheese layer, spoon remaining cheese mixture over sun-dried tomatoes, smooth top. Strike filled mold on counter top to pack down. Cover and refrigerate at least 24 hours. When ready to serve, turn mold upside down onto serving platter. Remove plastic wrap. *Layered torte dip is a delicious layered dip perfect to serve at any party along with this super Green Pepper Dip viva my sister Mary.